Apple's App Store today reached 50 billion downloads since its inception in 2008, and along with the milestone comes the end of the company's "50 Billion App Countdown" promotion launched thirteen days ago. The winner of the promotion, who is yet to be announced, will be awarded a $10,000 gift card valid for App Store, Mac App Store, or any other iTunes Store content. Fifty additional winners will receive $500 gift cards. 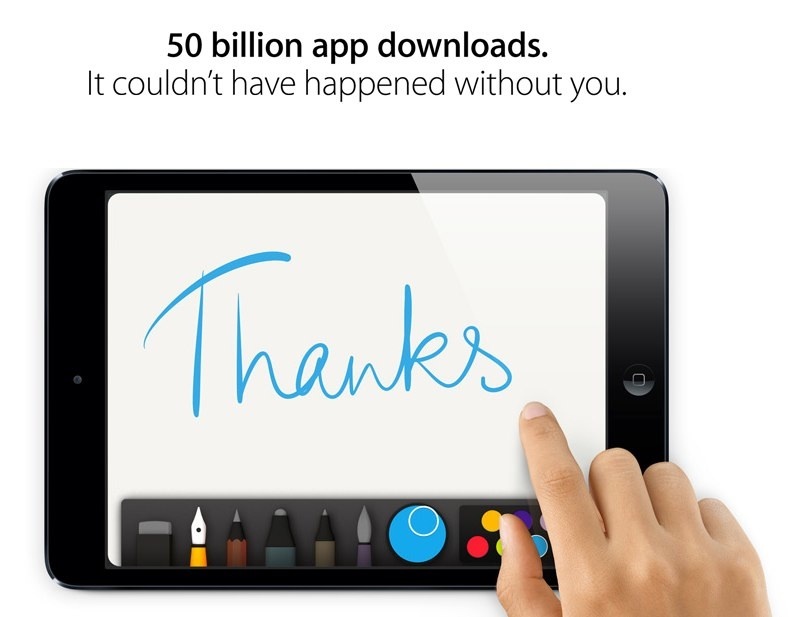 The milestone is being acknowledged on Apple's website with a graphic showing a "Thanks" message written using award-winning iPad app Paper by FiftyThree. The App Store took nearly 3 years, 8 months to reach 25 billion downloads, with the next 25 billion downloads requiring only about 14.5 months. With the last 25 billion downloads coming over a period of 14.5 months, Apple's pace is now at over 20 billion downloads per year or over 50 million per day. As tracked by our sister site AppShopper, Apple has approved a total of nearly 1.2 million apps for the App Store since its launch, with nearly 850,000 of them currently available in the store. Who else was in there at the last minute really gunning for it and downloading apps? I bet their traffic went up in the last 10 minutes! To be fair, the official rules stated: "Any download counter displayed by Sponsor is for illustrative purposes only. The potential winners will be determined by the order of the entries received." so it's quite possible the winner downloaded their app any time before or after that counter struck 50,000,000,000. Well first I would buy all the Apple Pro software Final Cut Pro, Logic, etc. I read the Android App store just hit 48 Billion. 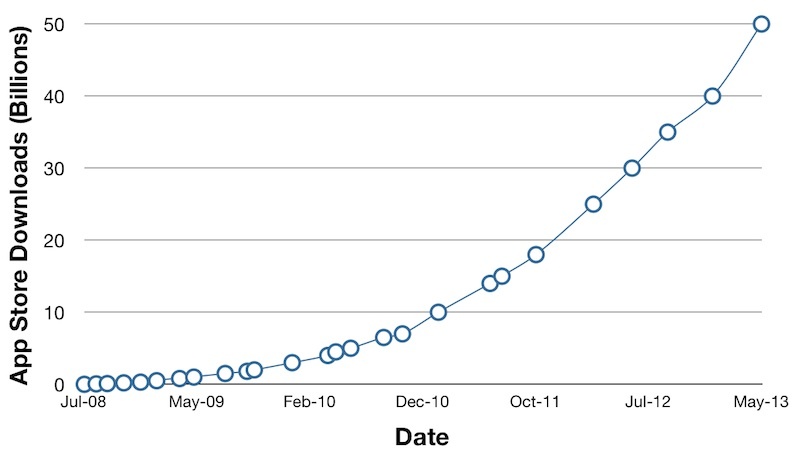 I wonder if Apple will flaunt the next milestone even if Androids numbers will ellipse it by multiples.